While the coming winter months will likely mean cooler temperatures, baked goods, and time indoors with the family, it may also bring with it heavy rains that can make it dangerous to drive on Orange County’s highways. This makes it important that drivers do not become complacent when driving in the rain this winter, as driving in the rain is riskier than many people think. While Southern California does not see the snow and sleet that other parts of the country get this time of year, you may be surprised to learn that rain is actually considered to be the deadliest weather to drive in. According to a study conducted by the U.S. Department of Transportation, 46 percent of weather-related crashes are caused by rain, which is more than the number of accidents caused by snow, ice, and fog combined. Driving in the rain is particularly hazardous for drivers due to the fact that while rain reduces visibility and traction, many drivers do not see rain as a threat and drive the same in the rain as they would on a sunny day. This makes it important that drivers take certain steps to improve their safety when on the roads this winter. Here are just a few of the things you can do to reduce your chances of being involved in a winter car accident. One of the first things drivers should do when winter arrives is to replace their windshield wipers. While a car’s windshield wipers serve a critical role by helping you to maintain visibility when driving in the rain, it can be easy to forget about your windshield wipers and not consider what condition they are in with how infrequently most Orange County drivers use them throughout the year. However, the sun and heat will degrade your windshield wipers over time, which makes it critical that you replace them at the start of each winter in order to ensure maximum visibility when it rains. Another critical step to take to ensure your safety when driving this winter is to watch your speed. These days drivers seem to always be in a hurry, which can make it easy for you to speed if you go with the flow of traffic. Even when there are heavy rains many drivers do not slow down. However, while it can be tempting to drive fast when you have somewhere important to be, it is critical that you slow down when driving in inclement weather. When the roads are wet during or after a storm, this reduces traction which can make it more difficult for your tires to grip the road. Reduced traction can make it easy to lose control of your vehicle when driving at high speeds, making it important that you do not speed when the roads are wet. In addition to slowing down when weather is bad, you should also consider increasing the distance between you and the cars around you when driving in inclement weather. When the roads are wet, this increases the amount of time it takes your vehicle to slow down and come to a stop. This is one of the primary causes of winter car accidents as drivers often misjudge the amount of time it will take them to stop at a traffic light when it is raining. Increasing your following distance then gives you extra room between your car and the car in front of you in case you misjudge the amount of time it will take your car to stop, which can help prevent a rear-end collision. Additionally, when visibility is low or there is inclement weather, increasing your following distance will give you extra time to react in case the car in front of you stops suddenly or there is an accident in front of you. As we previously mentioned, slick roads can make it easy for you to lose control of your vehicle when it is raining. 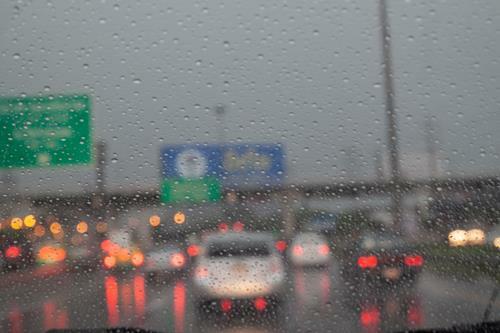 This makes it critical that you avoid any abrupt movements when you are driving in the rain. If you overreact and turn the wheel too sharply, or if you take turns too tightly, this can cause your vehicle to skid on the wet pavement. Your vehicle can also skid if you apply the brakes too hard, which is another reason why it is important to give yourself plenty of room when coming to a stop as you will want to apply the breaks gently in order to avoid losing control of your vehicle. When driving in the rain it is critical that you always drive cautiously and that you do not make any abrupt maneuvers that could cause your vehicle to skid on the wet pavement. When driving in inclement weather—whether it is raining, foggy, or overcast—drive with your headlights on during the day. Driving with your headlights on when visibility is reduced due to weather conditions is the best way to ensure that other cars around you can see you approaching. The fact is that when visibility is reduced, your car’s daytime lights may not be enough to help other drivers see you, which can put you at risk of being involved in an accident. Driving with your headlights on when visibility is reduced can help alert drivers around you to your presence, which can help keep you safe on the road this winter. It is also important for California drivers to remember that it is not only safer to drive with your headlights on when the weather is bad, but it is also required by law. California law states that when weather prevents a driver from discerning a person or another vehicle on the highway at a distance of 1,000 feet, or if it necessitates the use of windshield wipers, then drivers must turn on their headlights. Even if you do everything within your power to stay safe on the road this winter, you may find yourself involved in a car accident due to another driver’s negligence. If you have been injured in an accident and believe that the other driver is to blame, you should consider seeking legal advice as you may be entitled to compensation. Contact Aitken * Aitken * Cohn online or call (714) 434-1424 to learn about what your next steps should be after being injured in a car accident in Orange County. What Does the Law Consider a Hit and Run in California? Local: (951) 534-4006 Fax: (714) 434-3600?